I love chocolate, even white chocolate. I know, I know, white chocolate isn’t really chocolate, blah blah blah. But I don’t care. It’s still sweet and tastes good. Who cares about the technicalities when talking about desserts? I also love Tartelette’s blog. Everything she makes is beyond gorgeous, and her recipes are always to die for. While these brownies do taste amazingly delicious, sadly, they look absolutely nothing like hers. Fortunately, these are just going to my guinea pigs at the office, and they’re more concerned about taste than aesthetics anyway. My notes: I thought I had two white chocolate baking bars in my kitchen when in fact, I only had one, so I had to use 4 ounces of white chocolate chips as well. I LOVE white chocolate! There’s plenty of room in my belly for all kinds of chocolate goodness. Those sound really good, and I agree about Tartelette – she’s so talented! But most of my recipes go to the office vacuums, too, so I understand. Hi! Just saw your lovely post. 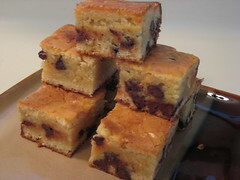 White chocolate brownies sounds divine! Can’t wait to try your recipe! Helen does have magic hands! Hilary, stop with the loe fest already. I am blushing. So glad you are back and cooking.Missed you! They look great! I think I got lucky on this batch, as I made them another time and they turned out more like blondies. I’m on a diet til tonight, so i can squeeze into a tiny little dress. Those brownies are SO not helping. =( The dress doesn’t seem worth it anymore! I’ve been making these for years and they always get rave reviews. I did notice that you changed the original recipe. You might want to consider using 8 oz (1 stick) of butter and 1 cup of chips. I prefer the milk chocolate chips with this recipe, as it marries well with the white chocolate. The additional butter results in a moister blondie that almost melts in your mouth. I promise you will love them, and they will look as good at they taste!